As the world faces a significant upward trend in conflict—including a tripling of civil wars since 2007 and conflict increasingly prevalent in middle-income countries—practitioners in peace and security have sought to expand their toolkits to take advantage of the revolution in information gathering, data analytics, and machine learning. Indeed, innovations in data are transforming the methods and the effectiveness of those working on early warning, conflict prevention, peacebuilding, and international security. 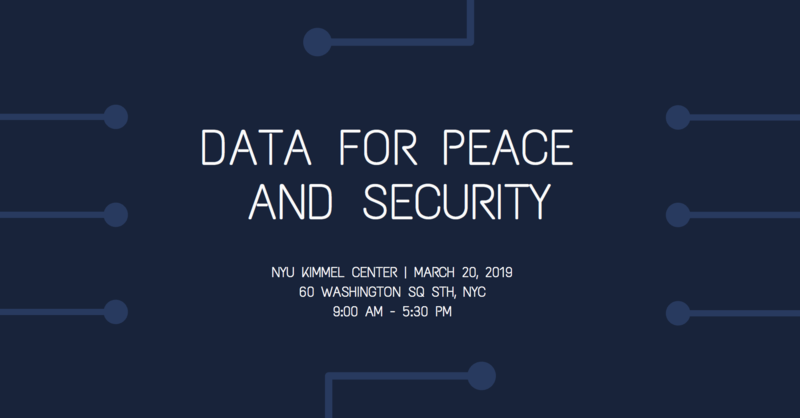 A range of actors—multilateral organizations like the United Nations, governments, non-governmental organizations (NGOs), and the private sector—are investing in the capacity to make better use of data to better promote peace and security. In this context, there are many initiatives ongoing, often working in isolation. These include developing practical and innovative data sources, better ways to mine and analyze data, algorithms to predict outcomes, use of technologies like blockchain, and data-driven applications. In many cases, these efforts result in specific user-products which in turn inform the workflows of policy advisors, advocacy officers, peacebuilding and development practitioners, and researchers around the world. Nonetheless, the peace and security field lags behind other sectors, like the humanitarian and development fields, in using data to drive innovation. It also lacks a community of practice across sectors (government, private sector, multilaterals, civil society). This community is needed in order to identify and build on lessons learned, prioritize the most important needs and gaps, and prevent duplication and supply-driven product development. The full-day program will contain a mix of (motivational) pitches, quick-and-dirty thematic sessions to collect and exchange as much information and insights as possible, a marketplace of ideas, and plenary feedback and discussion. Thematic areas will be organized in sprints, in which participants will showcase and learn about specific projects. **Please note the changed start time to 9am (instead of 8:30am). What are the big-picture, forward-looking trends in the field? by Kebba Touray, Economic Community of West African States (ECOWAS); Doug Bond and Sean Yeo, Harvard University and Virtual Research Associates, Inc. Rapid-fire report back from the facilitator of each group (2-3 minutes) and posting to the wall of ideas in plenary space. Walking lunch & networking through the marketplace of ideas in plenary space, which will feature additional innovative applications and solutions.